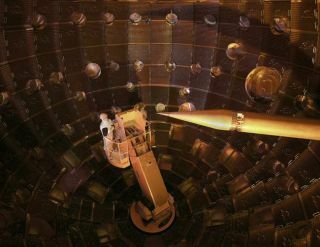 The interior of the National Ignition Facility's target chamber, where researchers plan to use 192 giant lasers to ignite a pinpoint fusion reaction. The service module carrying technicians can be seen on the left. The target positioner, which holds the target fuel capsule, is on the right. Lasershave usually represented weapons of mass destruction in movies such as"Star Wars," but a newly completed facility has begun harnessinglasers to create a fusion reaction rivaling the power of a miniature sun. TheNational Ignition Facility has already test-fired all 192 giant lasers atLawrence Livermore National Laboratory in California as part of this effort.The lasers will eventually focustheir power on compressing and heating a single, pea-sized fuel capsule tomore than 180 million degrees Fahrenheit in order to trigger thermonuclearfusion. "Oneof the major activities of the NIF is to explore the basics of fusion energy, buildinga miniature sun on Earth that could supply limitless, safe and carbon-freeenergy," said Ed Moses, National Ignition Facility (NIF) program director. Unlikenuclear fission reactions that split apart atoms inside existing power plants,fusion reactions create energy from atoms fusing togetherto form heavier atoms. The reaction normally only takes place within intenselyhot environments, such as the heart of a star, but researchers have attemptedto recreate fusion in a way that would produce more energy than it takes tostart the reaction. Just150 micrograms of deuterium and tritium, or less than one-millionth of a pound,can serve as the fuel for the NIF experiment. But containing the high-temperatureplasma from a fusion reaction represents a special challenge —temperatures of 180 million degrees F and up would melt any known substance,apparently including the metallic arms of Spiderman villain 'Doc Ock' in hisfictional fusion experiment from "Spiderman 2." TheNIF's laser-based approach uses an approach known as inertial confinementfusion (ICF), which takes advantage of Newton's Third Law about every reactionhaving an equal and opposite reaction. Therapid, intense heating from the lasers makes the outer layer of the tiny fuelcapsule explode outward, and that compresses the remaining fuel inward andhelps trigger the fusion reaction. Fusion burn consumes the cooler, outerregions of the capsule faster than the capsule can expand, which contains theresulting reaction. Thisstands in contrast to previous approaches that have relied on magneticfields to contain the plasma from fusion reactions, such as Europe's JointEuropean Torus project, although both could work. "ICFis analogous to an internal combustion engine where micro-explosions (as in acar engine cylinder) are continuously occurring to produce energy," Mosestold SPACE.com. "Magnetic fusion is more like a turbine that iscontinuously burning fuel to produce energy." Seriousignition testing scheduled for 2010 would focus 500 trillion watts of power onthe pea-sized capsule containing deuterium and tritium fuel. NIF has alreadyproduced 25 times more energy than any other existing laser system, and alsobecame the first fusion laser facility to break the megajoule barrier and create enough energy to power 10,000 100-watt light bulbs for a second. "Weplan to begin the first experimental shots of the ignition campaign inMay," Moses said.